I am excited to share with you about a new book I’m reading this month — Motivate Your Child: A Christian Parent’s Guide to Raising Kids Who Do What They Need to Do Without Being Told. Doesn’t that sound amazing? Isn’t that what you want for your kids? This will be the second book I’ve read by these authors. I previously read Say Goodbye to Whining, Complaining, and Bad Attitudes in You and Your Kids and it became one of my favorite parenting resources. I loved the Biblical advice and the examples provided by the authors. God’s Word gives us a better way to parent, one that builds strong internal motivation in children. When parents change the way they parent, kids change the way they live.Motivate Your Child is a practical book that explores a theology of internal motivation and then gives parents real-life solutions to equip their kids for life. This is the newest book by parenting experts, Dr. Scott Turansky and Joanne Miller, RN, BSN from the National Center for Biblical Parenting (NCBP), also authors of The Christian Parenting Handbook. 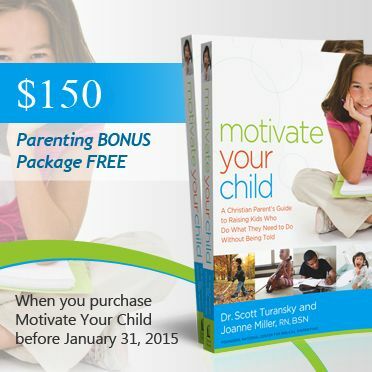 In order to motivate parents to Pre-Order the book, the NCBP is offering a $150 package of resources for FREE! There are video, audio and print items that can be used on a variety of devices. You can learn more on the Book Website. You can Pre-Order the book now from any retailer, and then follow the instructions below. Pre-Order from Amazon INSTRUCTIONS: Purchase the book. Email the receipt to gift@biblicalparenting.org. The NCBP will send you the link and a special code to access these downloadable products. This offer is good until January 31, 2015.